DIFFERENTIATION STRATEGY: Definition, What Is Differentiation? How To Develop a Differentiation Strategy and Distinguish Your Brand. Marketing Strategies. Differentiation is about setting your company, product, or service apart. It distinguishes your brand from all others. 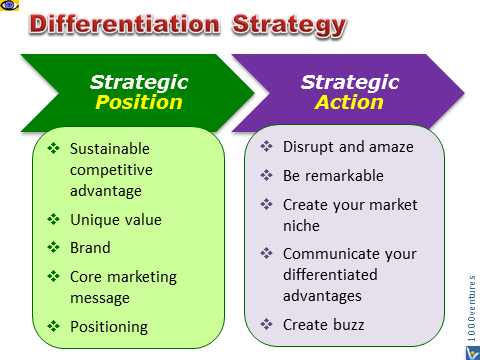 Differentiation is the key to successful marketing, competing, and building your sustainable competitive advantage. A superior product or service means nothing without a way of somehow letting your prospective customers know about it. Your differentness can be any customer benefit that separates you from your competitors. You must find that difference and communicate it to your customer.